Over the past few days I`ve had many a go at trying to shoot the emergence of butterfly pupae into adulthood, but more than a few have failed to complete the transition. The Monkey Puzzle pupa shown above opened a little before it froze and died. Seen above is the pupa of the Common crow butterfly (Euploea core). 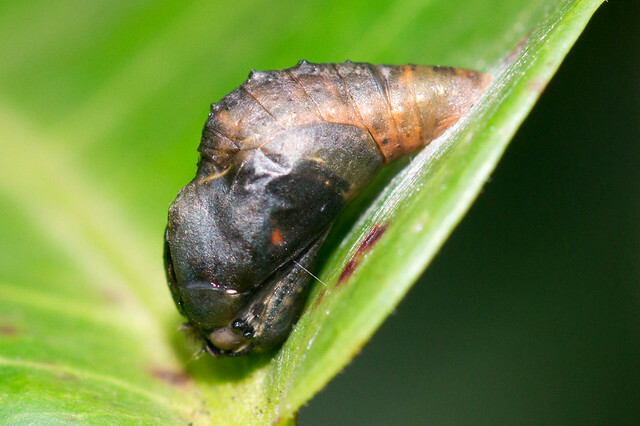 The metallic coloured pupa grows dark just before emergence. This one grew dark but then it didnt emerge. Slowly fine hair-like extensions could be seen on it, which soon grew into this fluff. 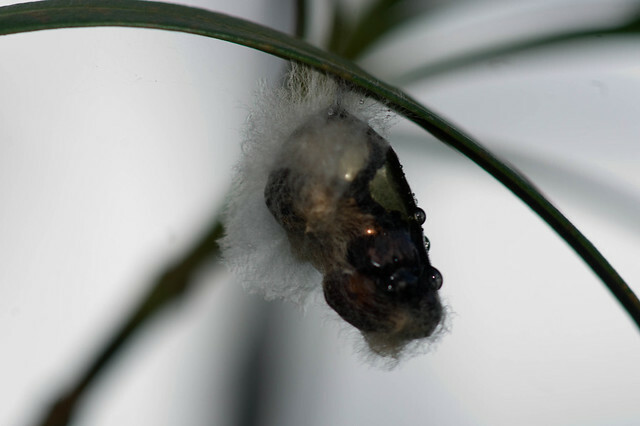 The white fluff is fungal hyphae which grow on the dead pupa and could probably have caused the aborted growth of the pupa. Shown above is the pupa of the three-spot grass yellow (Eurema blanda). The healthy pupa becomes transparent before emergence. This one though turned black and died. 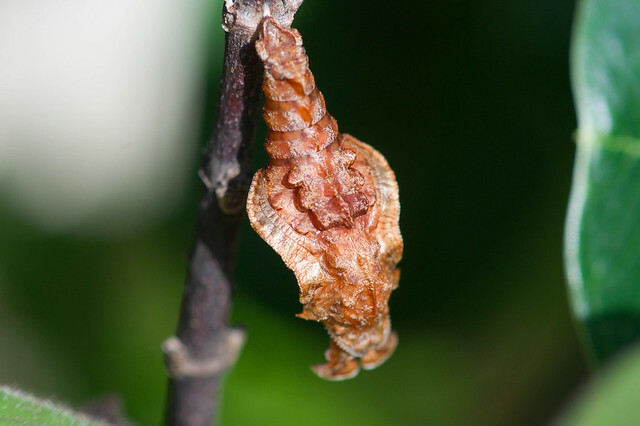 However, not all dead pupa change colour. 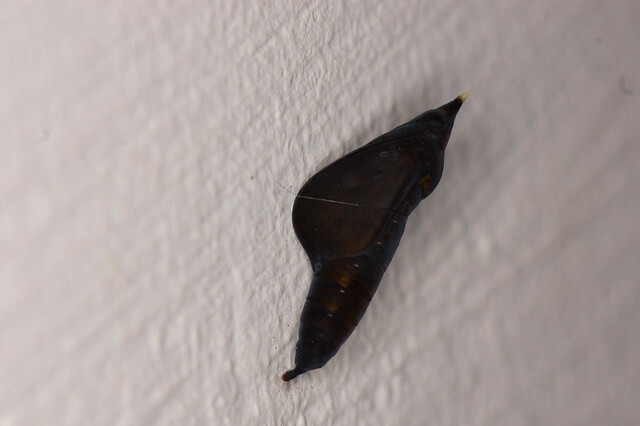 The pupa shown above is that of the Commander Butterfly (Moduza procris). It looks perfectly normal on the outside, but its been more than a month since I had been waiting for it to emerge. It is yet another instance of a stillborn pupa. So what happens to these dead pupa? Nature has a way of recycling everything. Most often they are eaten by ants. 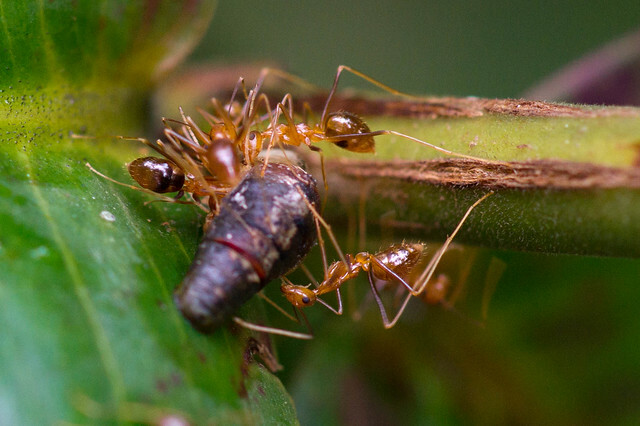 The images below show ants hacking away at a pupa that died just before emergence. 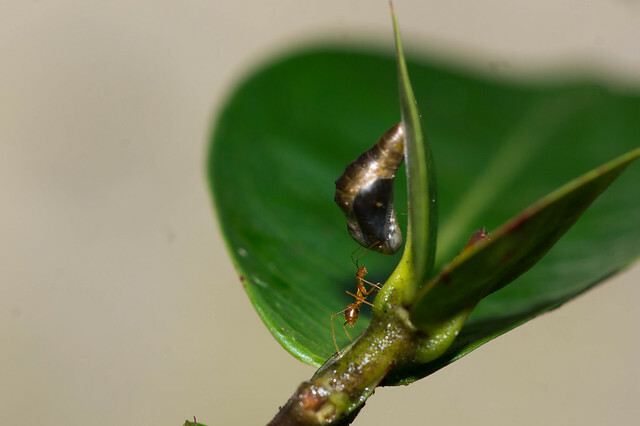 Soon they were joined by other ants which soon ate the whole pupa. 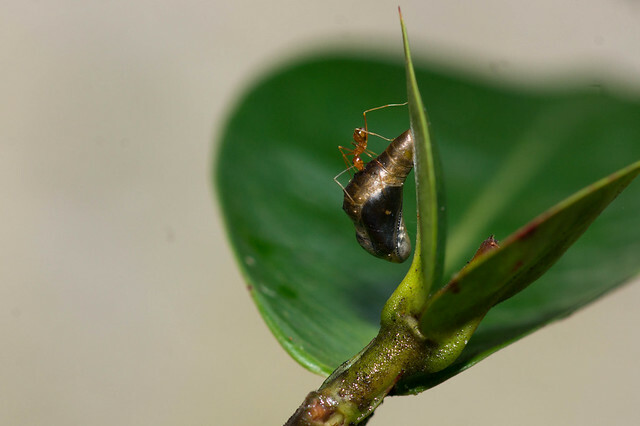 If ants can eat dead pupa, do they also eat live ones? My guess is that they dont. I`ve never observed that to happen. 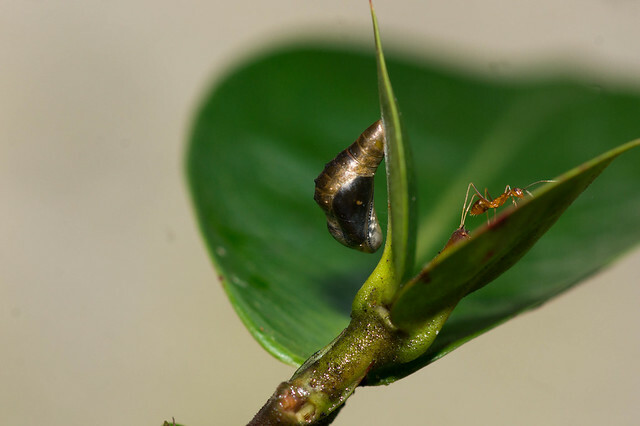 Ants do stop by to check on pupae. 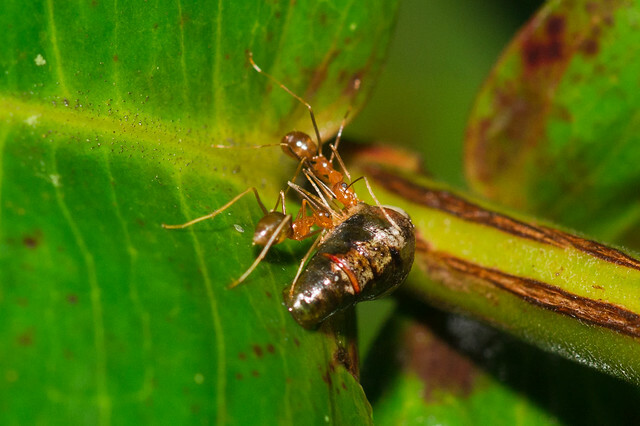 But as shown in the images below, once they ascertain that the pupae is healthy, they ignore it and walk past looking for better prey. Why do these pupae die? Probably due to multiple factors. Infection with fungus and viruses can be one reason. Genetic defects can be another cause; the transition involves huge developmental changes involving complex biochemical synthesis and assembly. Failure to synthesize the required proteins or structural components can lead to an aborted transition. Also, it is now monsoon season here in India and the pupae get drenched with every rain. If there is little sunshine to dry the dampness, there is a great possibility of infection and failure to emerge. The emergence of a pupa is meant symbolise new life, however stillborn pupa remind us that death is very much a part of life!